5 preset programmes with varying intensity you control, includes safety cut off. Who makes the best Ab-toning belts in the world? Well it's the Germans of course! 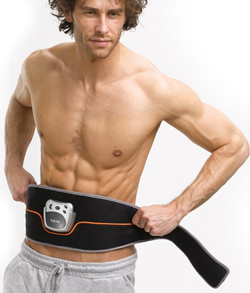 Using the latest technology Beurer have created an Ab toning belt to seek the correct muscles and then exercise them like never before! Even if you are 'cream-crackered' after a heavy training session, or nursing an existing training injury, this ab belt will help to tone and strengthen your core muscles quickly and easily. Using NMES - neuro muscular electrical stimulation which is also known as EMS electrical muscle stimulation - the belt pulses electrical stimulation to your core abdominal muscles through wires attached to rubber electrode pads laying against your skin. NMES therapy is widely used within sports medicine and within rehabilitation and physiotherapy to build muscle and repair damaged muscle, or to prevent muscles deteriorating after damage. One question we always get asked is by sportsmen and women and of course body-builders too is this: Do these ab toning belts really work—or are they just another unproven therapy? Well, Beurer wouldn't put their name to anything less than effective, and we can put the record straight here and now! A team of scientists at a Brussels University examined the effects of NMES on the stimulation of muscle fibres.and metabolism. What they found was NMES does in fact have a profoundly beneficial effect on the metabolic demand associated with the generation of muscular force, as well as improving muscle contraction. So this shows that an ab belt could be a beneficial addition to other training methods to improve overall efficiency of muscular contraction and the mind-muscle connection to give you the best ab workout possible. Finally an Ab belt that adjusts to your size and adjusts to your training levels - one size does not fit all! 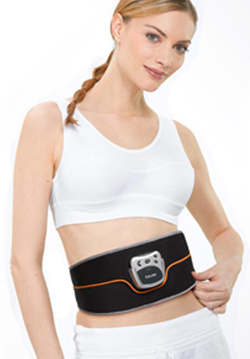 This Beurer EM35 Abdominal Toning Belt is by far the best home-use abdominal training belt available today. Fitting waist size from approximately 75cm (29 inches) to 140cm (55 inches) this ab belt offers you the best in today's functionality. Your ab belt should always be fully adjustable. Why? Well, when you start to notice the effects of that toned and honed 6 pack you will need to wear the belt even tighter! To be honest this belt has to be worn tight, you need to have good connectivity with the electrode pads, and if it isn't tight - you'll get a 'nip'. That means the electrode pads doesn't have good connectivity with the core muscles and is not exercising them properly - instead it is more like a 'zap' than full on muscle contraction! To get the best results remember your muscles will not grow while they are being exercised! It is the rest and relaxation that gives the growth to muscles so don't over-do it. However with stead, regular effort, you will be amazed how much progress you will make. Featuring 4 wear-free contact skin electrodes positioned perfectly to train your central and lateral (side) abdominals together with a easy-fir velcro fastening home exercising has never been easier. Made from conducting carbon material, these skin electrodes require no gel - simply moisten with water - meaning replacements are never required! So, unlike other ab belts that tie you into purchasing sticky pads and electrode 'amplifying' gels - this beauty is all ready to go! The Beurer EM35 offers adjustable intensity on its 5 different training programmes, offering varied interval muscle training to the abdominals, each lasting between 20-30 minutes, giving you time to catch up on your 'to-do' list! 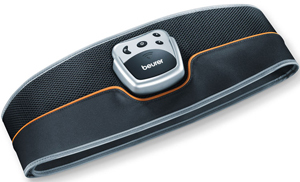 What do you get with the Beurer EM35 Abdominal Toning Belt?